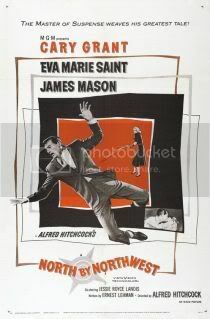 The extent in which I can compare Notorious and North by Northwest is that (1) they’re both directed by Alfred Hitchcock, (2) they both star Cary Grant, and (3), they’re both excellent. Having been on a Hitchcock kick as of late, I considered dumping the whole project after being disappointed by Shadow of a Doubt and Saboteur. Thankfully, two gems have revitalized my interest in the director. Initially, I was a bit worried by Notorious’ patriotic plot elements- there was a sense of overt patriotism that had me concerned that I had another Saboteur on my hands. This was hardly the case, as the notion of patriotism was merely used as a device to bring American agent T.R. Devlin (Cary Grant) and Alicia Huberman (Ingrid Bergman) together. Their relationship is beautifully realized, with a superb dramatic element that makes the whole film a joy to watch. Having been employed for a job by the U.S. government due to her notoriety as a loose woman, Alicia attempts to infiltrate the home of a Nazi named Sebastian (Claude Rains). This arouses jealousy from Agent Devlin, who discovers the nature of her job only after he has fallen for her. The technique that Hitchcock employs is truly impressive. He immerses the audience in a world of such peril and complexity. Alicia recovers a key that she intends on giving to Devlin. In order to keep her new husband’s attention elsewhere, Alicia suggests to Sebastian that the two ought to have a party. Hitchcock positions the camera at a distant staircase, moving it seamlessly to get an overhead view of the party and guests. He continues to move, without a cut, until he reaches the hand of Alicia, which is currently the location of the key. It’s a masterful scene that establishes the how danger, suspense, and anxiety can be allocated to one person in a room. Of course, what the key opens could hardly be relevant to the point of Notorious. It’s first and foremost a romantic film about lovers who are forced into a scenario that tests their conviction to one another. The trials and tribulations of love is a common thread in Hitchcock’s oeuvre, and can be clearly seen in North by Northwest as well. Whereas Ingrid Bergman and Cary Grant are completely aware of each other’s social positions from the onset, only to be surprised later, North by Northwest’s relationship is initially based on deceit. Roger Thornhill (Cary Grant) meets with Eve Kendall (Eva Marie Saint) on a train as he attempts to avoid a barrage of policemen. Currently wanted for murder, Roger keeps his reputation quiet as he lays on the charm. Eve sees through the façade and seduces Roger. Little does Roger know that Eve isn’t all she claims to be. Roger discovers that Eve works for the men who framed him in the first place – betrayed, Roger’s sense of commitment to Eve is tested, much like how Agent Devlin was tested when he discovered that Alicia was marrying Sebastian in Notorious. The flexibility in perceptions of self is something seemingly exclusive to Hitchcock women. 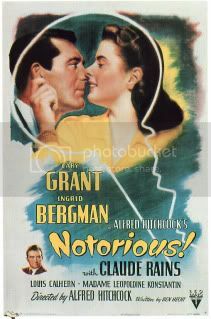 In Notorious, Alicia adjusts her life around the needs of those around her. Similarly, Eve in North by Northwest is actually used by the government. The two women essentially contend with more obstacles than their male counterparts, wherein they are driving the narrative. Both Notorious and North by Northwest aren’t merely exercises in style and narrative complexities – they’re also extremely entertaining pieces of action filmmaking that serve to immerse the audience in a world unknown to themselves. The grand appeal of Hitchcock films is their sense of relatability – no one needs to be a government agent to understand the palpable scenes of love in Notorious. The fear of a normal man caught up in something much bigger than he is can be felt by anyone. Hitchcock analyzes the most basic human emotions – fear, happiness, love – and simply uses that to catapult us through his narrative.